Barcelona, Spain, 26 February, 2018: Anokiwave today announced its presence at Mobile World Congress (MWC) 2018 in Barcelona Spain. Anokiwave 5G ICs will power more than 10 customer 5G arrays at all three mmW 5G bands. 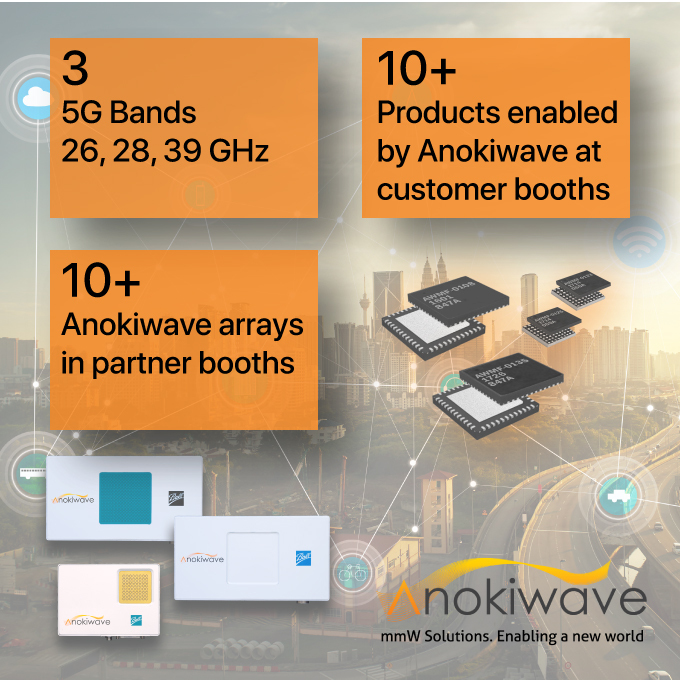 In addition, more than 10 Anokiwave Active Antenna Innovator Kits, driven by Anokiwave 5G ICs will be featured at several of our partner booths. Anokiwave senior staff will also be in attendance for private meetings with customers. To schedule an appointment us, please visit www.anokiwave.com/mwc2018. As part of our strategy to enable mmW 5G systems by industrializing planar active antennas with silicon core ICs, Anokiwave has introduced market leading silicon ICs at each of the major mmW bands - 26 GHz, 28 GHz and 39 GHz. The AWMF-0108 IC, first introduced in 2016, operates at 26.5 – 29.5 GHz, the AWMF-0123/5 ICs, introduced in 2017, operate at 37.1 – 40.0 GHz, while the AWMF-0135, introduced in 2017, operates at 24.25 – 27.5 GHz. Each of the quad core ICs feature embedded functions for remote telemetry and low-latency steering™. To demonstrate the performance achievable using low power silicon integration and efficient antenna layout and design, Anokiwave and its partner Ball Aerospace, have introduced a family of Active Antenna Innovator Kits at 26 GHz and 28 GHz. The 64-element and 256-element Active Antennas lead the way in showing how 5G coverage can be rolled out by network operators using the mmW bands, with low power footprint and high energy efficiency, while meeting key operating specifications for data rate, latency, coverage, and reliability. Anokiwave is a leading provider of highly integrated IC solutions for communications and RADAR applications that require millimeter wave Active Antenna based solutions. Anokiwave’s creative system architectures and optimal selection of semiconductor technologies solve the toughest engineering problems. Anokiwave is based in San Diego, California and operates design centers in Phoenix, Arizona and Boston, Massachusetts. Additional information can be found at www.anokiwave.com.